Quetta, Board of Intermediate and Secondary Education Quetta has already received the admission forms regarding FA/FSc Part 1 and 2 for the year 2014 from the candidates and now BISE Quetta is going to start the annual exams of Intermediate Part 1 and 2 for the year 2014 from 08 April 2014. Quetta Board has also issued the detailed date sheet of the eligible candidates mentioning the details of the subjects. The candidates should note the detail of their respective subjects and they can appear in the annual exams of Inter Part 1 and 2 for the year 2014. Quetta Board will also dispatch the roll number slips to the regular candidates in their colleges and to the private candidates to their home addresses, which are mentioned in their admission forms. BISE Quetta Board will conduct the annual exams of HSSC Part 1 and 2 for the year 2014 from 08 April 2014 and after the completion of the written exams, the practical papers will be started. It is also declared that Quetta Board will complete the checking of the annual exams papers within 2 or 3 months and will announce the result of the 11th and 12th classes during July or August, then the supply exams will be conducted for the failed candidates. This entry was posted in BISE, Date Sheet on February 28, 2014 by admin. For MA/MSC supplementary exams part 2 annual 2012 and annual 2013, starting under BZU Multan from 28th Feb 2014, the revised date sheet has been announced. Given below is the revised date sheet. The University has also notified that the girls’ examination centre for Sahiwal is Govt. Girls Model Pilot Secondary School and the name of Govt. Girls Model Elementary Secondary School Sahiwal was published by mistake. This entry was posted in Date Sheet, Universities on February 28, 2014 by admin. Board of Intermediate and Secondary Education Azad Jammu and Kashmir has declared the annual exams date sheet for the Matric class Part 1 and 2 for the year 2014. BISE AJK Matric Part 1 and 2 annual exams for 2014 date sheet and the roll number slips of the regular and private candidates will be dispatched on their home addresses and if any candidate does not receive the roll number slip, he may contact with BISE AJK Kashmir to get the duplicate roll number slips. According to the date sheet for the annual exams of SSC Part 1 and 2 for the year 2014, the annual exams of 9th and 10th classes will be conducted separately and the annual exams of Matric part 2 will be started from March 15, 2014 and the annual exams of Matric part 1 will be commenced from April 01, 2014. The practical papers of both SSC Part 1 and 2 will be commenced from April 22. The candidates should also note that the Matric Part 1 and 2 annual exams will be held in two groups and the details of the groups is included with Urdu, Mathematics, English, Physics, Islamiat Compulsory, Pak Studies, Chemistry, Biology and in the Arts groups, the papers are General Science, Home Economics, General Mathematics and Islamiat Optional. The admission schedule of M.Com (3.5 years) part 1, 2 and 3 for 2nd annual examinations 2013 has been announced by Punjab University Examination Department. 12th March 2014 is the last date for respective students to submit admission forms with single fee, while 17th March 2014 is the last date of form submission with double fee. Later, the exams commencement dates will be announced. This entry was posted in Admissions, Universities on February 27, 2014 by admin. The schedule for supplementary exams of M.Ed, B.Ed, M.Com part 1 and 2 has been announced by the Additional Controller Examinations GC University Faisalabad. Complete schedule for admission is given below. Swat, Board of Intermediate and Secondary Education Swat Saidu Sharif has released the complete and comprehensive date sheet for the annual exams of matric part 1 and 2 for the year 2014. According to the date sheet of the annual exams of SCC part 1 and 2 for the year 2014, the papers of both 9th and 10th classes will be commenced from the same date of 12th March 2014. The candidates should note the complete date sheet for the Swat Board annual exams of Matric Part 1 and 2 for the year 2014. In the meantime, BISE Swat has also released the date sheets and the roll number slips to the candidates so that they can become able to attend the annual exams of 9th and 10th classes. This entry was posted in Date Sheet on February 25, 2014 by admin. Multan, Baha Uddin Zakariya University Multan has the mandate to conduct the annual and supply exams of different programs at different levels in their campuses as well as in the distant learning programs. 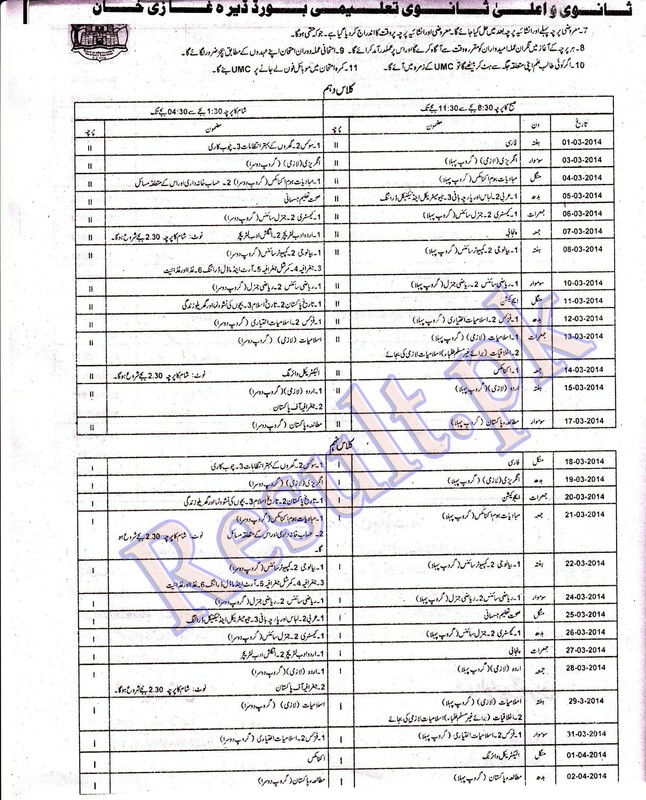 Now BZU Multan has announced the MA English and MA Pak Studies annual exams result for 2012. In the annual exams MA English part 1 for 2012 result, total 8 candidates were participated in which one was passed and remaining 7 were failed. Similarly, in the annual exams of MA Pak Studies Part 1 and 2 for 2012, 515 candidates were participated and 304 candidates were passed and remaining were failed. The result of MA Pak Studies and MA English are uploaded on the website www.result2013.pk for the students as they can watch their respective results with all relevant information. This entry was posted in Results, Universities on February 25, 2014 by admin. The date sheet of matric part 1 and 2 annual examinations 2014 has been announced by Board of Intermediate and Secondary Education DG Khan. According to the schedule, 1st March 2014 is the date for commencement of 10th class annual exams, while 18th March 2014 is the starting date for 9th class annual exams. This entry was posted in BISE, Date Sheet on February 25, 2014 by admin. Peshawar, Khyber Medical College Peshawar has the mandate to conduct the exams of medical students of the medical institutes and colleges located in the KPK province. KMU Peshawar has its own schedule for the management of the exams of MBBS classes and it also held the second annual exams for MBBS class two or three months before. After the preparation of the result of the second annual exams of MBBS class, KMU has declared the annual exams result for 2013. KMU has also mentioned that in this second professional annual exams of MBBS class for 2013, 1453 candidates were participated and 829 were passed while remaining were failed. In this way, the result of the second annual exams for MBBS class remained 57%. The candidates, who want to check their results with all relevant information, they can visit the website www.result2013.pk as the result of second professional annual exams of MBBS class for the year 2013 have been given there for their facility. AJK University has declared the MBBS professional 2nd examinations 2013 results. The result cards are sent to the mentioned addresses of the candidates, while the results are also available at university website. For failed students, last date for admission form submission with normal fee is 10th March 2014 in City Chehla Campus.